A black and white negative of Marion Rowe (left) and Helen Maguire (right) sitting outside on a cement walkway. There is a house in the background. In this view Marion is looking towards the photographer and Helen is sitting sideways looking at the photographer. Both girls are smiling. 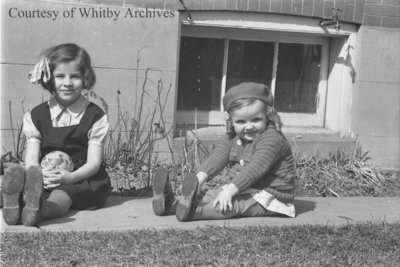 Marion Rowe and Helen Maguire, March 22, 1938, Marjorie Ruddy. Whitby Archives A2013_040_794B.